One of our newer partners is Alpha Kappa Alpha, which is one of the oldest African-American sororities in the country. Their national office is located in Wisconsin, and the sorority has chosen to take up the cause of mental illness stigma reduction. They started a coalition to reduce stigma in Milwaukee, named the Mental Illness Stigma Reduction/Recovery Coalition. The group comes together monthly to create collaboration, and in the upcoming months, they will be holding community Mental Health Forums. The forums will be held in different locations, such as churches, NAMI GM, and Grand Ave. Club. Here is a flyer, and for more details on forums, contact Sandra, samelch@yahoo.com. Wisconsin Family Ties (WFT) is a statewide, not-for-profit organization run by families for families that include children and adolescents who have emotional, behavioral and mental disorders. The mission is to provide greater understanding, acceptance, and support in the community for families having children and adolescents with emotional, behavioral and mental disorders. Hugh Davis is executive director of Wisconsin Family Ties. He has been active in WISE as a regularly attending member of the advisory board, and he also serves on the youth, parent, child and school action team. WFT has been a pioneer of a new parent peer specialist model. WFT Parent Peer Specialists team up with individual families and the professionals working with them to help them clarify their options and to access services for their children. The stigma families face when raising a child with an emotional, behavioral, and/or mental disorder too often causes parents to internalize attitudes of blame for their child’s challenges and to become increasingly isolated. As isolation grows, their ability to access help for their children decreases. Parent Peer Specialists can be a great resource to families, and can help ease family isolation and frustration as they assist families to access the services their children need to become productive and successful citizens of their communities. HOPELINE, by the Center for Suicide Awareness, is a text-in (versus voice call-in) free service for help and hope. 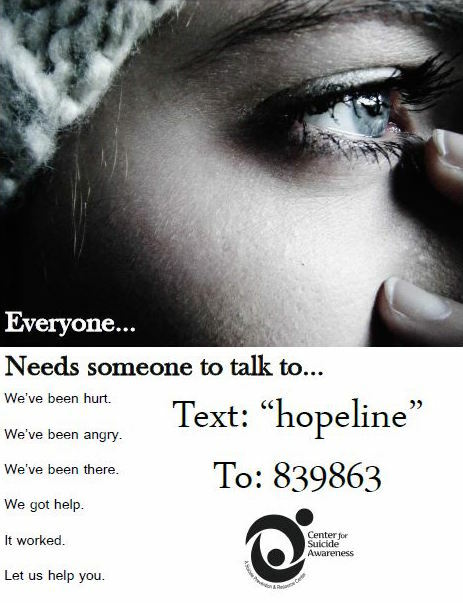 HOPELINE is the first Emotional Support Text Line in the State of Wisconsin and provides service throughout the entire state. HOPELINE’s purpose is to offer emotional support and resources before situations rise to crisis level. Texts received reflect struggles with breakups, job loss, bullying, LGBTQ issues, parental issues, school, friends, relationship issues or any struggle a person is experiencing. HOPELINE Text Line serves anyone in any type of situation, providing them access to free, 24/7 emotional support and information they need via the medium they already use and trust: text. Someone texts into HOPELINE — 839863 — anywhere, anytime, about any type of challenge or struggle. Thank you for using and supporting HOPELINE! If you’re interested in volunteering as a HOPELINE Responder, applications are being accepted! Free HOPELINE posters are also available for download. Barb Bigalke is executive director of The Center for Suicide Awareness. She is also chair of WISE’s marketing action team, has played a large role in the work of WISE from early on, and is actively involved in stigma-reduction efforts throughout the state. This month we’re shining the spotlight on HOPELINE, a new resource from the Center that we encourage WISE partners to take note of and spread the word about! Mental Health America of Wisconsin (MHA) has been a key player in WISE from the start. MHA has provided in-kind and financial support, and has helped shape the focus and vision of our coalition. MHA staff have assisted with WISE Basics and Honest, Open and Proud, served on action teams such as healthcare and fund development, and they also hosted the WISE Public Ally, Rachel Niemann in their offices at 600 W. Virginia St. for three fourths of her two year term of service, to name just a few examples. 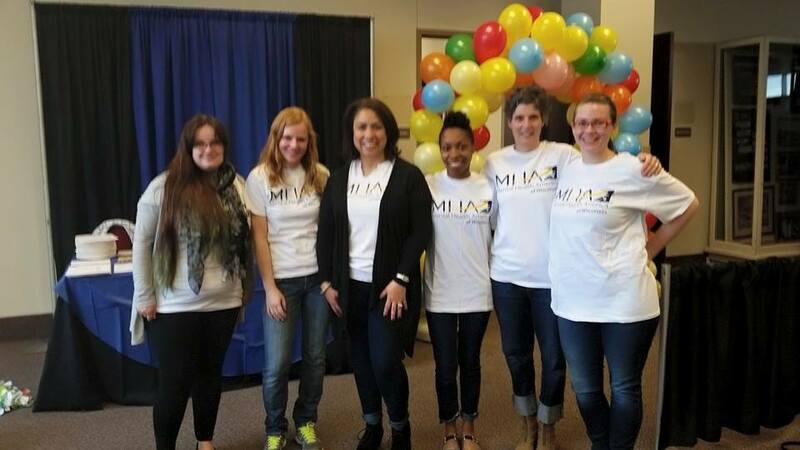 The staff of MHA have been endlessly supportive, giving, and hardworking, and we are grateful for their partnership! MHA Wisconsin is an affiliate of the nation’s largest and oldest community-based network dedicated to helping all Americans live mentally healthier lives. MHA touches the lives of millions by advocating for changes in policy and providing leadership for mental health issues at the state and local level. Each year, they educate the public, provide critical information on their website, and answer hundreds of calls on their telephone helpline for mental health consumers looking for resources. They also deliver urgently needed programs and services that are dedicated to serving and strengthening families. Check out the video below from United Way featuring Dawn Zak, Associate Director, and Anne Fojut, Strong Families Healthy Homes Program Supervisor. In this video, a recipient of services shares her personal story to highlight the impact of the Strong Families Healthy Homes program.